Nan Smith’s research in the visual arts investigates installation-oriented figurative sculpture with an intent to convey a sense of human consciousness and to reflect a perspective on the relativity and unity within existence. Her use of fragile, fired earthenware clay to create hyper-realistic, life-sized figures reflects her work’s underlying theme of the temporal quality of human existence. She incorporates her figures into a tableaux formed by beautifully crafted metal and wooden constructions, which possess an illusive, otherworldly quality. The life scale and spatial compositions encourage a direct link between the installation and the audience. Smith embraces a wide range of techniques in her non-traditional approach to ceramics. 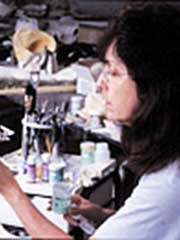 She employs progressive casting and mold-making techniques for ceramics, often at large scale, and airbrush painting on ceramic sculpture. Smith uses AutoCAD computer design software to generate cut-steel installation elements and mirroring imagery for ceramic airbrush stencils. She is currently developing designs generated from line drawings of flora and Florida greenery. Smith’s sculpture has appeared in nearly 100 exhibitions throughout the United States and has been featured in more than 30 art publications worldwide, including two covers. Her national reputation in her field has made Smith an extremely sought after lecturer who has presented 30 national lectures in the course of her career. In the past five years, Smith has been awarded nine grants and fellowships. Her numerous awards include three Florida Individual Artist Fellowships and the National Endowment for the Arts Regional Award for Sculpture sponsored by the Southern Arts Federation. Her work is included in the collections of the American Express Corporation and the Lamar Dodd Art Center at LaGrange College in Georgia.